Shortly after [Gotovina’s acquittal], the Appeals Chamber struck again with the acquittal of the Serbian Commander Chief of Staff, General Perisic, when the Chamber decided that even though his military and logistical support from Serbia in the Bosnian-Serbian forces in Bosnia had contributed to the forces’ crimes against Bosnian Muslims and the Bosnian Croatians in Bosnia, Perisic had “not intended” for his forces to be used to commit crimes. He provided the support, but was unaware, according to the Appeals Chamber, that the support would be and was used to commit crimes in Bosnia. This despite the media’s daily coverage of the Bosnian-Serbian forces’ macabre crimes against Muslims (and to a less extent Croatians) in Bosnia. […] Now apparently the commanders must have had a direct intention to commit crimes – and not just knowledge or suspicion that the crimes were or would be committed. [I]n most cases, the provision of general assistance which could be used for both lawful and unlawful activities will not be sufficient, alone, to prove that this aid was specifically directed to crimes of principal perpetrators. In such circumstances, in order to enter a conviction for aiding and abetting, evidence establishing a direct link between the aid provided by an accused individual and the relevant crimes committed by principal perpetrators is necessary. Since Perisic’s involvement in providing general assistance was deemed to be remote and not “specifically directed” to the relevant crimes committed by the Bosnian Serb army, he was acquitted of aiding and abetting liability. The question that remains, is if Judge Harhoff was so outraged by the legal and factual conclusions of the Perisic Appeal Judgement, why did he then endorse the very point of law that resulted in the acquittal of Perisic, as well as Stanisic and Simatovic? What recourse does a trial judge have when he/she disagrees with the Appeals Chamber on a point of law? Judge Harhoff could certainly have written a separate and dissenting opinion on the specific direction requirement. Trial judges have disagreed with the Appeals Chamber in the past, notably Judge Lindholm who filed a separate and partially dissenting opinion to the Simic et al Trial Judgement to “dissociate [him]self from the concept or doctrine of joint criminal enterprise in this case as well as generally”. Judge Harhoff could even have used some of the “tenacious pressure” that Judge Meron is accused of to persuade his fellow trial judges to follow his lead (the late Lord Denning would certainly have been proud). But instead he undermined the tribunal for which he serves by disclosing confidential information about deliberations he was not a part of, second guessing the outcome of those deliberations (at least privately), and displaying the appearance of bias towards convictions. What this letter provides is a rare glimpse into the opaque world of a judge’s privately-held views and biases. 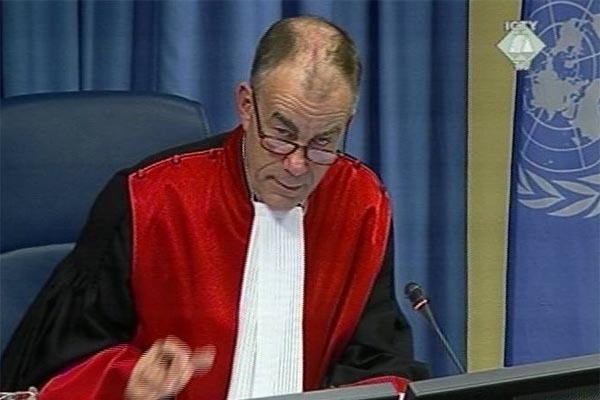 If Judge Harhoff’s “official view” endorses the specific direction requirement and yet his personal view is that it leads to unwanted acquittals that are not in the “interests of the victims”, it is difficult to see how this would not lead to his removal from the Seselj case for the appearance of bias, as has been requested. A panel of three judges is now considering the request. Update: Thanks to Luka Misetic for alerting me to a similar point he made regarding the Stanisic and Zupljanin Trial Judgement in a comment to an earlier post at EJIL Talk. This entry was posted in Aiding and Abetting, International Criminal Tribunal for the Former Yugoslavia/ICTY, Judge Harhoff, Judge Meron, Perisic, Rights of the Accused, Specific Direction by Alex Fielding. Bookmark the permalink.